"We designed these large flat spoons to be able to scoop out larger amounts of rice from the pot, but they can be used for many other things too. 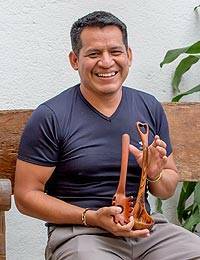 And since we carved them from natural wood, they won't scratch your pots," explain the Peten Wood Artisan Sculptors. The spoons are carved by hand from natural jobillo wood, which is a sustainable wood with brown to dark red and golden hues. * Please note that hot and/or spicy food may dye the natural wood, yet spoons can be filed and finished with oil to return to natural coloring.